The retail industry is a place where change is the new constant. Globally, the retail sector has been undergoing a revolution of sorts that is driven not only by the fast-changing consumer preferences and behaviour patterns but also advances in technology. Foreign and domestic retailers operating in India too have started taking steps to deliver the next unique experience to their shoppers. As a result, in-store experiences are gaining importance not only for engaging shoppers inside the store but also to catalyse buying decisions of the casual or undecided shoppers. Discounts offered by online retailers and marketplaces may be tempting but the human engagement factor that is offered by physical retail outlets are definitely more compelling and still not out of fashion. Lately, the inclination of the Indian consumers towards international brands has become quite apparent. Post liberalization, as the economy unlocked the international market, imported goods steadily gained a grip among the otherwise reticent and unaware Indian buyers. Indian shoppers are today seasoned global buyers and expect a shopping experience that is equal to international standards that they are accustomed to. 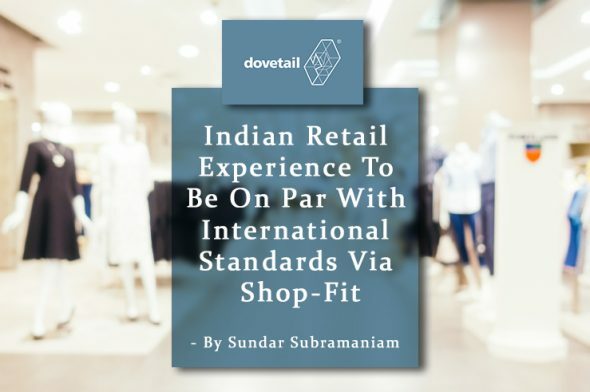 Retailers in India have now reached a point where they must either explore ways to match these international standards or get out of business. Consumer lifestyle in India has been through a massive transformation. The Indian consumer who used to save most of his/her income and purchase only the bare necessities about 10 years ago is now planning holidays every weekend and changing clothes according to fashion trends. Commodities and services that were considered luxuries years ago have now become very common and fast selling in the market. The Indian consumer has gone through a remarkable transformation. Higher income, credit cards and even the desire to improve the standard of living and exposure to the shopping culture of the west is what has affected the young consumers of today. With multiple malls and organized retail that offer a variety of products, the needs of the Indian Consumer. So how does one keep up with the increasing demand for the quality, technology and efficacy of the retail outlets? Retailers need to ensure that they make the necessary investments to ensure their uniqueness that they stand out. Focussing on the front-end solely may not showcase results as scale almost invariably reduces costs. Factors like utilities, ambiance, client servicing, after sales service and stores that are equipped and built to attract consumers are crucial today. This is where shop-fitting plays a crucial role. Shop-fit and fixtures provide Indian shoppers a retail experience that is on par with international standards. The next decade of retail in India would no doubt belong to retailers who successfully adapt newer technologies and upgrade their in-store experiences quickly. Shop-fitting has almost replaced the old and conventional system of shop building through the use of carpenters. The new concept of retail designs are not generic but are full of character and personality. The retail designs are well thought of, resulting in multi-sensory ambience, great atmospherics, functional and aesthetic fixtures that draw in customers. With shop fitters, you can expect a number of things that are on par with the state of the art international standards including designs, professional working and Production drawings, creating custom fittings and/or furniture to meet your business’ in-store marketing needs, creating a pleasing visual effect for customers, and making a comfortable and effective work environment for employees. Shop-fitting is the one sure shot way to improve the look and efficiency of your retail space. It can even aid when one is planning a renovation. From flooring types, electrics, plumbing, lighting, fixtures, shelves and more, shop-fitting points you towards the right direction. It ensures the best visual use of your available space and pays heed to the specific look and style needed for your store. Shop-fitting gives you that access to exclusive products and materials that are unique to them. With increasing space constraints, it also benefits one in getting the most out of the available space. Whether you want to impress customers, improve your store design or even make your space more worker-friendly, shop fitting is the way to go. Call the pros so that you do not have to struggle with your displays and shop layout while trying to meet international standards. The article was originally published on Bizztor.